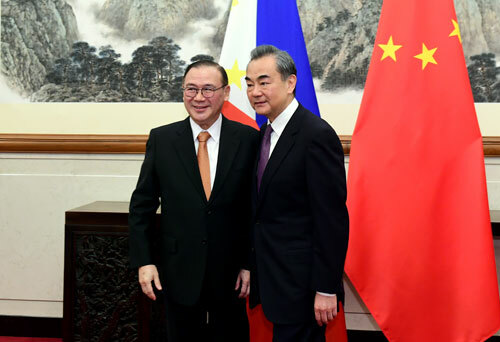 On March 20, 2019, after the talks with Foreign Secretary Teodoro Lopez Locsin of the Philippines in Beijing, State Councilor and Foreign Minister Wang Yi told Chinese and foreign journalists that the Belt and Road Initiative put forward by President Xi Jinping and the "Build, Build, Build" program put forward by President Rodrigo Duterte are highly compatible, therefore both sides should further deepen the integration of the two. Under the care and support of the two heads of state, actions in this regard have already gone into the lead. Over the three years, we have launched a series of major cooperation projects, which benefited various areas including economy and livelihood of the Philippines. We will also continuously promote regional connectivity and development to bring benefits to the whole region. 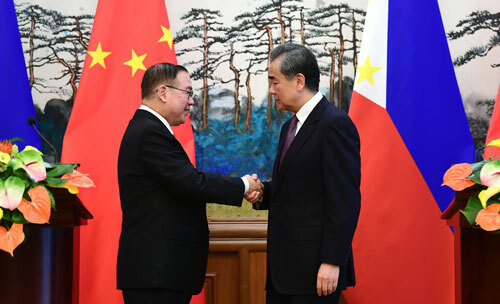 Wang Yi pointed out that currently, both China and the Philippines are actively negotiating for the cooperation planning of the next stage in a bid to further make clear cooperation area and formulate a specific roadmap. We will continue to advance major infrastructure construction projects, and we will implement, plan for and accumulate groups of projects respectively and forge highlights and quality projects. We will continuously focus on the improvement of livelihood and boost employment and development through infrastructure construction and the building of industrial parks to benefit more Philippine people. We will work vigorously on skill training and technology transfer cooperation to help the Philippines strengthen capacity building and elevate industrial structure and the level of industrialization. Wang Yi stressed that the second Belt and Road Forum for International Cooperation will be held in Beijing next month, during which the leaders of the two countries will meet again. This will provide new important opportunities for both sides to further integrate the Belt and Road Initiative and the "Build, Build, Build" program. Both sides will reach a series of new important consensus to this end and sign more cooperation documents, which will open up broader prospects for the two countries to expand mutual benefit and win-win results and share development and prosperity.